Sportswear brand adidas Originals is bringing “Stripes Sessions” to Rome this fall/autumn. Having recently launched its first global music event series “Stripes Sessions” in June, adidas Originals has been showcasing some of the most popular electronic music acts at select Originals stores around the world. 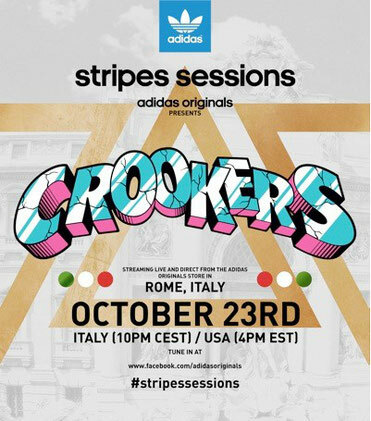 After hosting the first Stripes Sessions’ gig in Paris featuring Dada Life; the second with AraabMuzik in Berlin; and the third with Hudson Mohawke in Osaka; adidas Originals will present a live performance by Crookers at the Originals Via del Corso Store in Rome, Italy on Tuesday, October 23rd. Crookers’ set will be live streamed on facebook.com/adidasoriginals at 10PM CEST/4PM EST where fans across the globe will be able to tune in. This Stripes Sessions performance marks a homecoming for Italian DJ/production artist, Crookers, who will treat those in attendance, and those watching via live stream, to an eclectic mix of street style, rap, house and electro. Check behind the scenes of the Stripes Sessions Osaka show and Hudson Mohawke with Melanie Iglesias below.